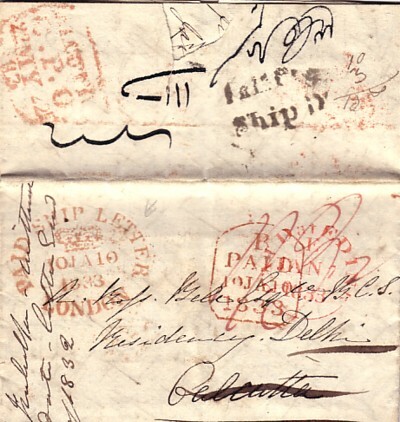 London Posts — London Ship Letter Office. * Denotes the British County (London) Catalogue number. 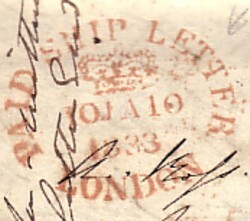 This part letter bears the abbreviated form of "letter" — "LONDON SHIP LRE". This is the first type and the size is 36x11mm, struck in black ink. The 'S' of 'SHIP' is directly below the 'L' of London, the down stroke of 'E' of LRE is directly below the first down stroke of the 'N' of LONDON and there is no dash between 'SHIP' and 'LETTER'. 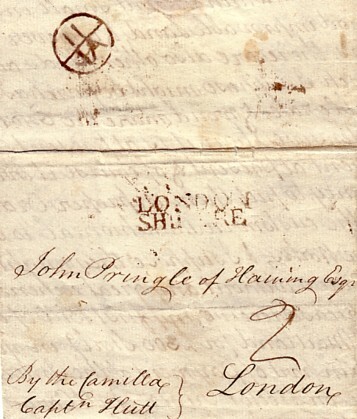 Addressed simply "John Pringle of Haining Esq. London" it was carried "By the Camilla — Captain Hutt" as indicated at the bottom left corner of the piece. Although undated, the piece must be from the period 1773-1787, as the Bishop Mark on the reverse is the 20mm. circle type in use between these years. Manchoneal as that gentleman had lately bought an estate there which, but small in itself is very good improvable land and is never in want of seasons, there are also other lands adjoining to it, which I suppose might be purchased at a reasonable rate and would make the estate much more extensive than it is at present. The works are deficient at present and of course it would require some money to put them in proper order, but it is not the custom in Manchioneal to build expensive works, and I suppose they might be put in good order without any great expence. Inclosd please receive my first Bill of this date on Mefs Maitland for £300 Sterlg in your favor Sir , being in part of payment of the Interest of your Mortgage on Hector RIver. Mrs. Cargill and Mrs Farmer and Family joins me in respectful Compliments to you Sir and Mifs Pringle, I am with esteem and respect, D Sir, Your most hum. svt Thomas Cargill. click here for details Type UNPAID LCC 1216*. Size 26-28mm and struck in black ink. "the low indifferent old Indians get from their long stais in this country and when they go home their friends are disgusted with them and they return the compliments. If I now thought I shd lose the traces of former affections in my mind I do trust I may never return. As to my falling in love (as it is termed) I think that very unlikely in the first place there are but few exceptions to my opinion of my countrywomen coming to this country with the avoyed purpose of seeking a husband and as to the halfcasts, blue skins, or whatsoever name they are designated I hope I shall never (hole in paper) be so caught with a face as entirely to overlook the mind. 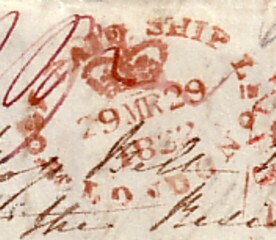 POST PAID SHIP Lr/Crown/Date/LONDON type mark. The size was 38x29 mm and it was struck in red ink. 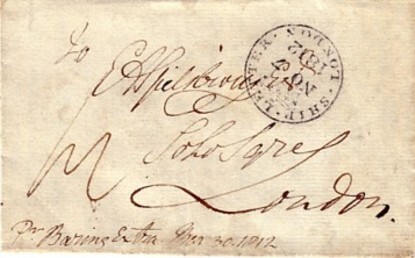 PAID SHIP LETTER/Crown/Date/LONDON type mark which was in use from 1833-47. The size was 37x30 to 40x31mm and it was struck in red ink. 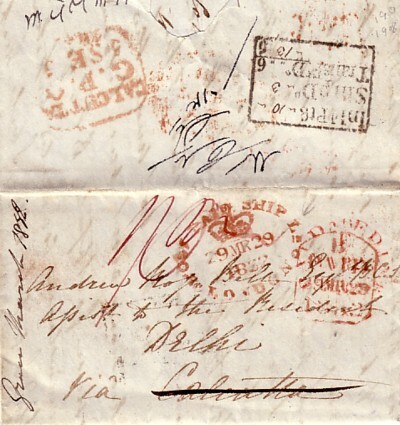 The other markings on the cover are:- "Paid at Edinburgh Jan 7 1833", red manuscript 1/3½, London 'tombstone' Jan 10 1833, and on the obverse a red "Calcutta G.P.O. 22MY22 33", the black accounting stamp and the Indian script marks. 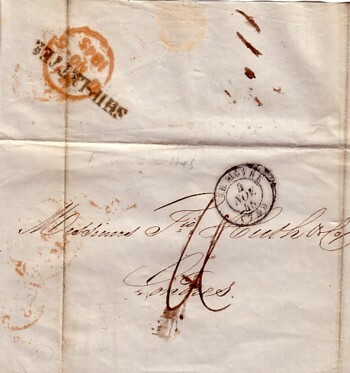 This cover from Le Havre to London dated 4th November 1845 has the straight line SHIP-LETTER, 41 x 5 mm struck in black ink. 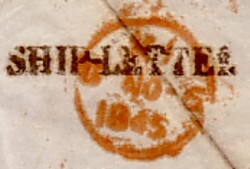 It is interesting to note that the SHIP-LETTER mark appears to have been struck over the top of the London receiving stamp 'NO 6 1845' rather than vice-versa.